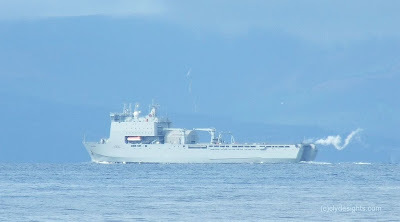 One of four similar ships built for the Royal Fleet Auxiliary by Swan Hunter on the Tyne, and BAE Systems at Govan, spent the weekend at anchor off Largs for the first few days of the Viking Festival. LARGS BAY, the only ship of the class to be completed by Swan Hunter (her sister LYME BAY controversially having been completed on the Clyde), joined the RFA in April 2006. At 176 metres overall, and over 16,000 tonnes displacement, the 'Bay' class ships are designated as Landing Ship Dock (Auxiliary), and replaced the 'Sir Bedivere' class landing ships that had served with the RFA for more than 30 years. Fitted with a stern dock, they are able to operate with landing craft, and also have a flight deck for helicopters while carrying up to 700 troops in full wartime conditions. Propulsion of these highly sophisticated ships is by twin azimuthing units, driven by diesel-electric power. LARGS BAY was seen as she headed out into the lower Firth of Clyde after her visit to her namesake.